The emotions from this season’s NBA playoffs have been unreal. 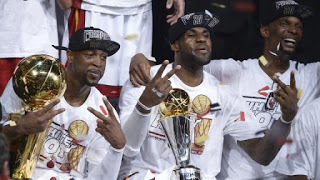 The way the referees were calling the games, the off and on of our star players, injuries… No one could have scripted what went down in Game 6 that gave us a Game 7 that lead to Back to Back Championships for the Miami Heat. The fans in Miami went buck wild. They were lighting fireworks in my neighborhood and Calle Ocho was off the chain as usual with the pots and pans. Miami will be partying all weekend long. It is great to be a Miami Heat fan!!! The countdown to Football season starts now!!!!! !